As a business, we’re always on the lookout for ways to reduce our inclusion of single use plastics as far as possible. There’s always room for improvement but it’s definitely been on our radar for years. We haven’t used plastic carrier bags for over thirty years and we provide paper bags for customers to buy their loose fruit and veg. We will soon be able to offer organic cotton produce bags for customers to buy and reuse – more news on this to follow soon. Additionally, the packing boxes from most of our deliveries are available to customers to take their shopping home in and we are always happy to accept donations of unwanted plastic shopping bags to be re-used. Our coffee cups, deli pots and straws are all from Vegware – a company that specialises in food packaging that is corn starch based and compostable. More recently, our larger shops in Staverton and Yealmpton have installed gravity fed dispensers for dry goods such as rice, pulses, cereals and nuts and we are encouraging customers to bring their own containers and opt for these as opposed to the pre-packed alternative wherever possible. We’ve started stocking a range of Le Parfait jars, again to encourage people to think about bringing their own containers and refilling them. 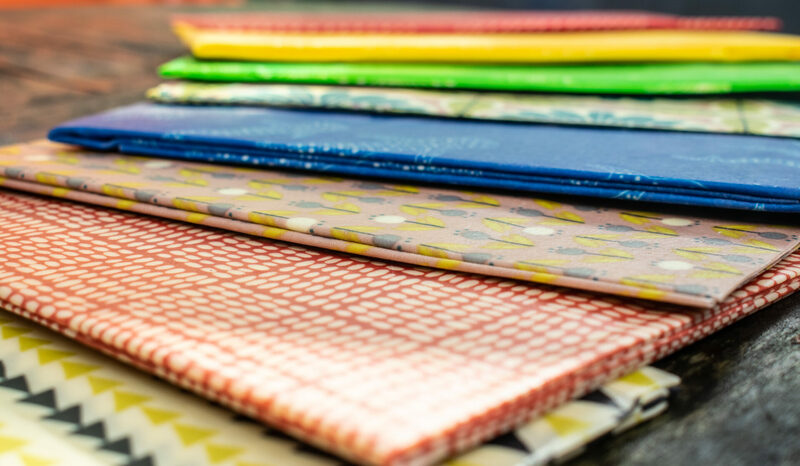 New in to the shops this year are Beeswax food wraps from Cambridge based company Bee Bee. These are made from organic cotton and beeswax (of course) and are a great alternative to clingfilm for wrapping foods and preserving their shelf life. 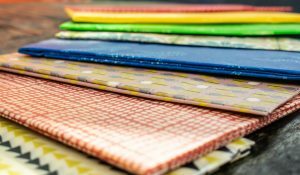 They come in various sizes and start at £14 per pack – a snip if you consider that when properly cared for, each wrap can last a minimum of a year. We accommodate the local authority glass recycling bins at Staverton and Yealmpton, however they are not always consistent in their approach to emptying so we do ask that if the bins are full that customers please do not leave empty bottles in the car park as we and our shop staff have no means of clearing them up. Our butchery has stopped using the black plastic meat trays and switched to grey ones, which in theory are much more easily detected by the sorting machines in recycling facilities than the black, that often go undetected and end up in landfill. Wherever possible, we wrap meat such as sausages, bacon and steaks in paper and the butchers have seen a reduction of around 15% in the use of white plastic bags for wrapping meat in the last year – it’s a start and we hope it will continue to improve as awareness is raised. Ultimately though the most effective way to cut plastic use here is for customers to bring in their own clean containers and we will fill them with the meat cuts of your choice – we’re aiming to publicise this more widely in the coming months to raise awareness amongst our shoppers, so please tell your friends! Some of our products are currently (unavoidably for now) sold in single use plastics – our soups for example and it is here that we feel there is a strong case for turning single use into multi use – bring them back to us, they’re pretty handy for storing your organic BFS beef mince! Our suppliers are doing their part too, with Dartington Dairy offering their milk in glass bottles that can be returned for cleaning and reuse – as it stands at the moment we probably get about half of ours back – not brilliant but definitely a step in the right direction. Yealmpton based Pip’s Pick Your Own (one of our soft fruit suppliers) will be switching to cardboard punnets this year, which is fantastic news. Whilst our main focus will always be food, we offer refills of Bio-D cleaning products and supplier Essentials will take away any unwanted Bio-D containers to be re-used or recycled correctly. We’ve introduced solid shampoo bars, bamboo toothbrushes and plastic free cotton buds at Staverton and Yealmpton too. As a business,we use Devon Contract Waste – a company that has a ‘zero to landfill’ policy which includes ‘clean’ incineration of plastics that converts them to green energy. As regular buyers of our mince pies will know, local council recycling services vary hugely, so we are more than happy to take back any non recyclable plastics (such as the mince pie trays of previous years) and dispose of them through the shops, so at least we know they’re being disposed of as responsibly as possible. Below: organic cotton and beeswax wraps from Bee Bee Wraps.